Discover the best of Niagara has to offer on this guided small group sightseeing tour of Niagara Falls from Toronto with a free pick up from your Downtown Toronto Hotels in our Luxury Mini van or our Luxury Mini Coach bus. 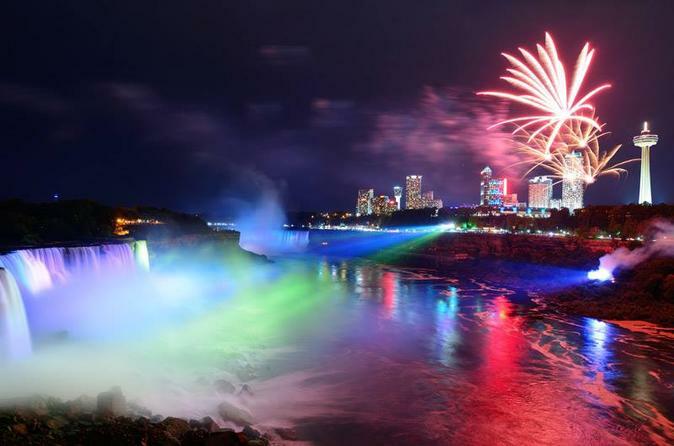 On your 9-hour tour, you'll experience the natural wonder of Niagara Falls both during the day time and at the night time and famous Illumination and seasonal fireworks. Hop on the Hornblower Boat Cruise to experience the Falls firsthand, front and center OR during winter months enjoy the thundering 13 storied high water fall from the Journey Behind the Falls excursion. Stop at one of the award-winning wineries at Niagara-on-the-Lake for free wine tasting of the renowned ‘Ice wine’ and enjoy free time to explore the historical town of Niagara-on-the-Lake. Take advantage of photo-ops at scenic stops we make on the Lake Ontario waterfront, One of the largest Floral Clocks, Whirlpool rapids, Table Rock, and Clifton Hill. Discover the breathtaking sights and sounds of the Niagara region on this small-group tour to Niagara Falls from Toronto in a Mercedes-Benz Sprinter or a Luxury Mini Coach. This highly rated 9-hour day trip will showcase all the points of interest on the Canadian side of Niagara Falls. 1.5 hours of scenic drive to the falls from Toronto. Start your tour through the orchard-laden countryside of the Niagara Peninsula. Drive past the historic community of Niagara-on-the-Lake. British Prime Minister Sir Winston Churchill described this route as "the prettiest Sunday afternoon drive in the world”. Visit Canada’s Award Winning wineries for our complementary wine tasting of the ever famous ‘Ice Wine’ and two other wines (or grape juice tasting). Stop at the Whirlpool Rapids - North America’s largest series of standing waves. Witness the Rapids from the edge of the cliff. If a bird’s eye view is what you’re after, consider adding the helicopter ride for an additional cost (tickets sold at discount). Feel the power of the Falls from Table Rock and feel like you are right on the top of the Falls at the waters edge. Walk along the Table Rock and feel thundering natural phenomena. Experience all three famous waterfalls is from the famous Hornblower Niagara Cruise (formerly known as the Maid of the Mist). Get up close and personal with the magic of the mighty Niagara Falls – Illuminated in rainbow colors–a memory that will last a lifetime. Enjoy a delicious buffet dinner at the Penthouse Sheraton Fallsview Restaurant (with dinner upgrade) that offers not only a delicious variety of meals but also the best view of the Horseshoe Falls. After dinner, you'll have free time to explore your own at Niagara Falls, Clifton Hill by the Falls, other attractions, souvenir shops and restaurants. The day tour ends with the popular Niagara Falls Fireworks and return trip to Toronto and a hotel drop-off. Starting June 12th, enjoy fireworks displays over Niagara Falls five nights a week (every Monday to Friday) ending on September 4th. Holiday shows include Victoria Day (May 22nd), Memorial Day (May 29th), Canada Day (July 1st & July 2nd), Independence Day (July 4th), Civic Holiday (August 7th), and Labour Day (September 4th). All performances begin at 10 p.m. and are subject to change. As always, fireworks performances are weather permitting and may be cancelled due to poor weather conditions like high winds or rain.